Many tourists travel to Bali for its sun, sand, and sea. Beyond its surf-worthy beaches, outdoor activities and spiritual/detox retreats, Bali offers delicious (and affordable) food. Here are 4 local spots that you should check out to eat like a local in Bali. Located at the beginning of Kuta’s most visited strip, this food court lookalike spot is the most visited spot for those who love pork and satay when they are in Bali. Barbecued on the spot, the meat is tender on the inside, yet slightly charred and crispy on the outside. A portion of the pork satay costs IDR 25,000 and comes served with rice cake and the ultimate Balinese sambal (mix of salt and squeezed chili). Portion wise, 1 portion of Pork Satay & rice cake is quite small, so we’ll recommend foodies to take 2 portions to keep their bellies happy. One portion of pork satay served with rice cake and Balinese sambal. The aroma of barbecue fills the air. You have not arrived in Indonesia if you have not eaten Indonesian food. This local spot is famous for its selection of dishes at a very affordable price. You can put together your meal by choosing your favourite dishes from behind the glass display at the restaurant. 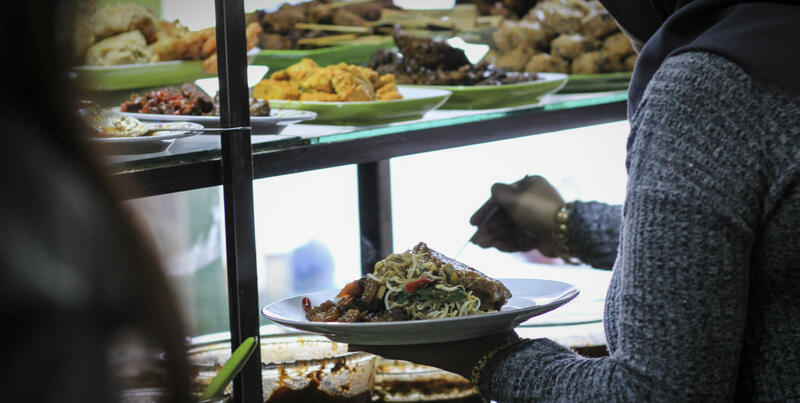 They serve a variety of flavoursome Indonesia dishes including different types of rice, vegetables, meat, and fish, ranging from mild to spicy in taste to suit your preference. Look out for this sign when finding your way to Warung Nikmat. Dishes you can pick and choose from, displayed behind the glass. A simple meal made up of the dishes you have selected. You are also able to order some additional items from their menu, such as crispy fried chicken, or chicken soup Indonesian way. Quench your thirst or calm your spiced up tongue with non-alcoholic drinks and fresh fruit juices from their own juice bar. Expect to pay between IDR15,000 to IDR30,000 for a meal, depending on your choice of dishes. Bali is well known its local dishes and one that you cannot miss is Babi Guling (Suckling Pig) dish. Seasoned with local herbs and spices, the pig is then roasted whole until the meat is so tender it melts in your mouth and its skin so crispy like a cracker. Served together with Balinese soup and rice, this dish is a definite must! As always, this dish goes best with local sambal; this level of spiciness can be adjusted upon request. A simple yet fulfilling meal here is priced at IDR 20,000. This shop also offers delivery around Kuta area through WhatsApp so if you’re feeling a little lazy, why not have it delivered to your doorstep? You know you've arrived with the welcome of this sign. Putting together that Babi Guling dish of braised meat, crispy skin, crackling and a good dose of sambal. The tropical island feels would not be complete without a cup of iced tropical fruit juice to counter the heat. Right in the center of Kuta Beach, this juice shack sits alongside other food stalls in the area. There is a huge selection of fruits from the usual orange, watermelon, melon, mango and dragon fruit to richer ones like avocado, and even durian. You can choose to have them juiced, blended with milk into a milkshake or simply cut up to be eaten, with the additional choice of condensed milk and sugar on top. A glass of juice is priced from IDR15,000 to IDR25,000 and a bowl of cut fruits costs IDR20,000. Located right in the center of Kuta Beach. Choose from all the tropical fruits available. A bowl of cut fruits for IDR20,000. Enjoy your stay at Hard Rock Hotel Bali.